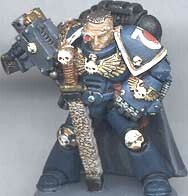 This scout sergeant started as one of the old Space Wolf scout sergeants. 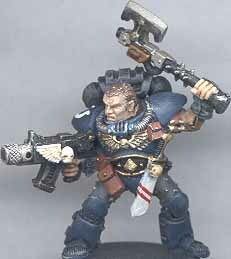 To make it less wolfy, I removed the wolf head from the bolter, and replaced it with the head and wing from a plastic banner pole. I added the power axe (a plastic one with the curvy part cut off the bottom). To help distinguish the sergeant from the rest of the squad, I usually attach a space marine backback to his back. 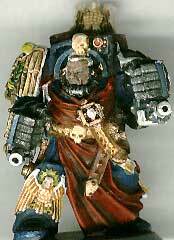 I paint my Ultramarines dark blue, and use white logos and trim colors. 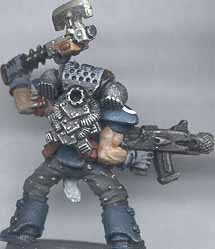 One of the neatest features of the old metal Space Wolf scout sergeants is the bare arms, which paint up nicely. I painted the arms tan, did a light brown wash, and just a bit of light tan drybrushing to achieve this rather nice effect on his arms. 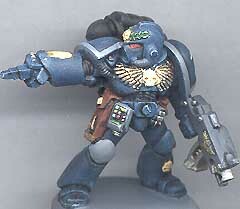 Here's a typical tactical marine painted in ultramarine colors. I use grey for the shoulder pad trim on tactical models since it is more subdued than white, which makes the model look more "practical". 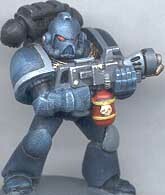 This is the metal flamer marine, which has a nice pose to it that paints up well. The Ultramarines don't have very many special character models, so I tend to use the nicer "generic" models for them. 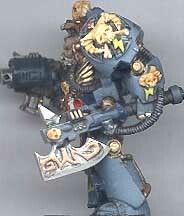 This is a stock metal sergeant model, painted in typical Ultramarines colors- a dark blue faintly drybrushed with light blue, grey shoulder (and knee) trim, and gold and white details. 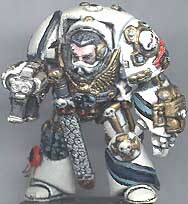 This is an old "limited edition" model captain available at Games Day many years back. No, I didn't make it to games day (I live in California, it's a bit far to Baltimore, thank you)- I actually got lucky and found them in blisters at the local shop. The model is completely stock- I really like the power glove and power sword detail. I finally got around to painting up a Marneus Calgar, and I must admit, it's actually quite a nice model. I mixed up a custom burgundy-red for the cape, tasset, and braiding. I've also done more elaborate highlighting on the blue edges. I usually rely almost entirely on washes and drybrushing- this kind of highlighting by hand is usually only found on Eavy Metal team models, but what the hey, this mini is worth the effort. A back shot. I painted the beaks and claws of the eagles yellow and the bodies white, then gave them all a brown wash to shade and subdue them. The cape has some highlighting brushed in (red over burgundy). The metal parts were painted steel, then washed with dark brown. I cut the banner pole off- I felt the model looked more rugged and practical without a banner. It's a shame seeing character models left in the dust in favor of a generic Terminator, so I did this quick conversion for Marneus. I simply removed his arms and attached them to the new terminator Captain. The standard pole was replaced with a banner top since I couldn't put the eagle backpack on the armor. I used the same colors, but they came out richer here (better wash I guess). 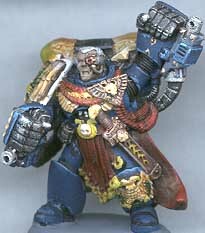 A Terminator librarian. I used a blue-grey for the main color, and dark blue and yellow for trim colors. The inlay on the axe is painted copper, as is the psychic hood. Rather than put a banner on him (I hate banners on terminators), I cut off the banner pole top and glued it directly onto the back above the hood. 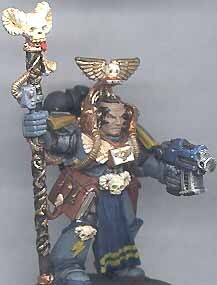 One of the stock Librarian models, painted with a blue-grey I mix myself. I like using blue-grey (rather than just blue) to make the librarians stand out from the regular Ultramarines- besides, this way they can double as grey knights! 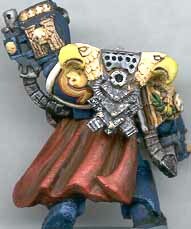 Blue robes and yellow trim complete the "character" look of the librarian. I use gold, leather, and white for the accessories. I actually painted the psychic hood (the cowl around the head) with Copper, giving it a more arcane look I felt was appropriate for a psyker.